Intense, wearying, joyful, painful, sad, insightful, fattening, irritating, depleting financially, and overall very worthwhile. I found a living situation that is at once incredibly fortuitous and awkward, and have had plenty of opportunities to watch my irritation and resistance get triggered by someone else’s irritation and resistance. It’s returned me to bodhicitta practice, which is the only way I feel able to short-circuit the churning mind that is reacting to situations instead of letting them go. I also did further training as a dharma teacher (also helpful in the live situations), so I might be able to support the community of meditation practitioners wherever I land next year. 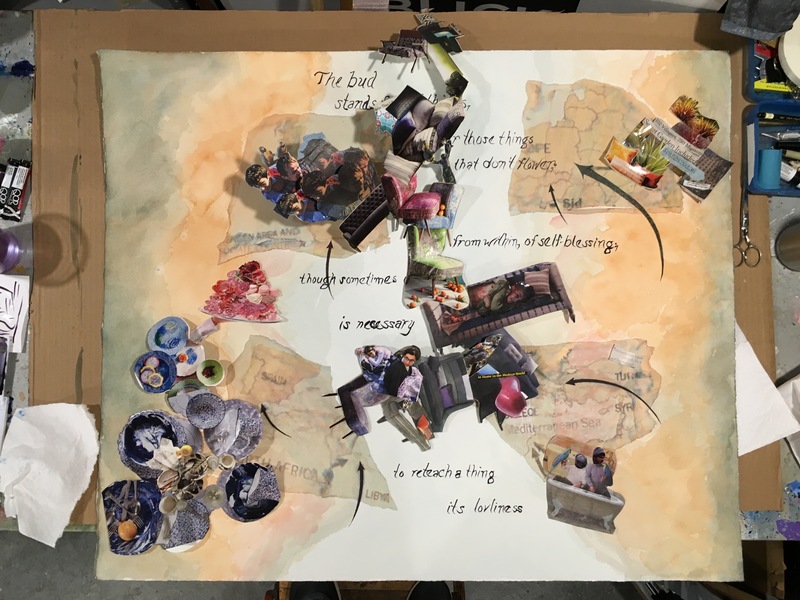 As far as the art-making goes…I love my mixed-media class, where I work on my own projects. Started slow, and have been working at a fury pace the last week or so to finish one large piece, and a few smaller ones. Meanwhile, I studied drawing full-time in October and part-time in November, which revealed a lot of limitations and pedagogical frustration. Perhaps after 3 years of drawing classes I might be producing things freshly, and as enjoyably as when I am making assemblages, painting, writing or singing, but it’s not feeling any more natural than before I came…in fact, less. My first instructor had me focus on how I use line to describe the figure…so I gradually developed a bunch of beautifully-outlined figures, but no volumes, expressions, environments, etc. 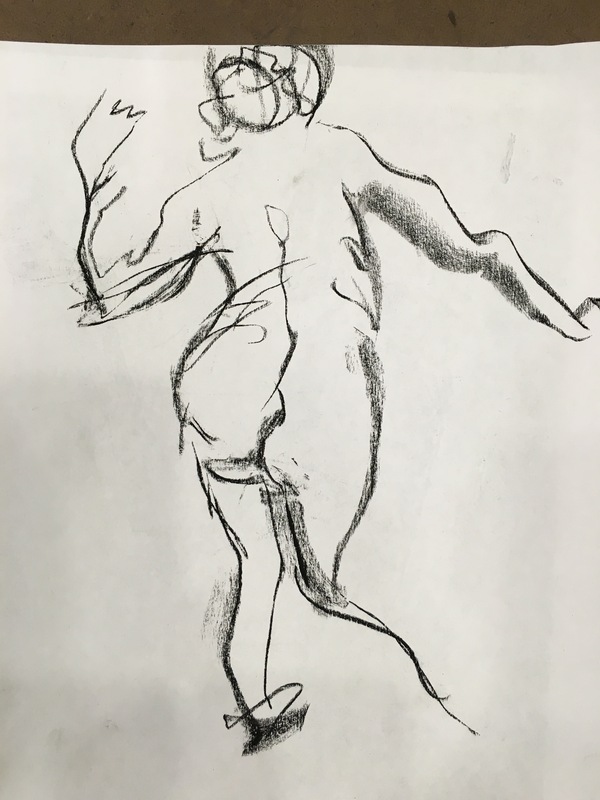 Then I switched to part-time and that instructor disdained the outline altogether in favor of structure, vectors, responding to the movement of the pose, including the background of the studio and how one uses the page. All useful things to think about, but now I had to completely rewire myself and produce very unsatisfying results, instead of building on what I’d spent a month developing. Like learning to play music, or speak a foreign language, the process of becoming masterful at drawing is mystifying. What I confirmed through this process is I am interested in drawing as a way to capture human expression, the face, the experience of lives intersecting with the world at a given moment, and the qualities that make a beautiful drawing in general, whether realism or abstract. I made some advances in exploring these aspects of drawing, but realized finally that I have to do more work on the street without the formality of instruction shadowing me. You can see some of the other drawings I liked in my sketchbook. Week 1, pre-instruction: 20 minute drawing.